Here at Floodlight we are always learning and believe in the importance of trying something new. Communicating makes the world go round, so learning how to speak to different cultures is always top of our list, whether this means learning Italian on a Wednesday evening, or attempting to pick up Dutch on a Saturday afternoon. Yet as many of you search for British Sign courses, we wondered whether we were missing one very important language off our list. As we begin our signing journey, we thought we would share 11 things we hadn’t realised about British Sign Language. 1. It’s hard to know exactly how many people use British Sign Language as their main language, but estimates range from between 30,000 and 70,000. 2. Figures from the British Deaf Association suggest up to 250,000 people use British Sign Language each day – this includes parents and partners communicating to deaf family members, teachers and translators. 3. Deaf children can learn sign language in the same way that other young children learn how to speak spoken English. 4. The British Sign Language (BSL) finger alphabet was developed by Daniel Defoe in 1720 and has barely changed since then. 5. 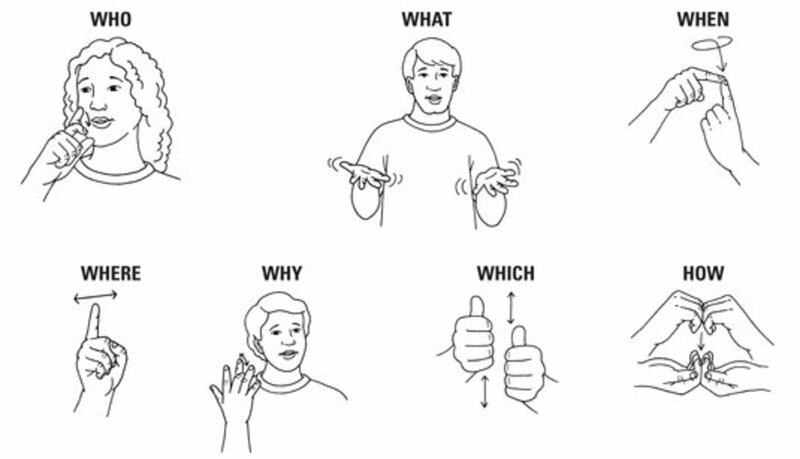 British Sign Language has its own grammar, which is formed using the spaces in front and behind of the signs and through other physical expressions. One example of this is evident when asking a question in sign. A well formed question will have the correct eyebrow position; the brows should be down for a who, what, when, where or why question and up for a yes or no question. 6. Every word in the English language does not have a direct translation in British Sign Language – it is all about interpreting and is a language in its own right. 7. A lot of us will not have realised that British Sign Language is very different to American Sign Language or Spanish Sign Language – it is not universal. 8. In fact, even within British Sign Language there are regional dialects, so there are signs and words used in Scotland that may not immediately be recognised by those signing in London. Like spoken English, there are also words that appear in the language and disappear as part of popular culture. 9. Did you know that British Sign Language has had a bit of a controversial history? The 1994 Education Act demanded that sign language stayed away from English classrooms and deaf schools were encouraged to use the ‘oral’ system. This meant a lot of deaf children left school with a reading age much lower than their years and appeals were made for this to be changed. 10. It wasn’t until 18th March 2003 that British Sign Language was recognised as a language by the British Government. 11. Approximately 90% of deaf children are born into hearing families who have usually never encountered deafness or sign language before. This highlights the importance of British Sign Language learning here in the UK. If you are ready to get back into the classroom and learn how to sign, we are here to help. With full-time, part-time and online British Sign Language courses available, what are you waiting for?